Transform your computer or mobile device into a guitar amp and effects rig! Control your favorite guitar software on stage and in the studio with assignable knobs and foot switches. GuitarJack Stage is two accessories in one: a rugged pedal controller and a premium quality audio interface for compatible Mac, PC, iOS and Android systems. Featuring studio quality I/O with 24-bit AD/DA converters, 1/4 inch jacks for all connections, an aluminum chassis, customizable pedal controls, and multi-platform compatibility, GuitarJack Stage is one of the most versatile pieces of gear on the market. GuitarJack Stage is device powered. Add an external power supply to charge an iPhone, iPad, or iPod touch (or reduce power consumption for compatible Android devices) while you play! Plug in an instrument and mic/line source to record or play live with incredible sound. The instrument input is optimized for guitar, with warm, mojo-infused tone, while the stereo mic/line input is ultra clean. The 24-bit AD/DA converters by renowned audio designer, Joe Bryan, move two channels in and out with clarity and vitality. Five assignable knobs and four foot switches make it possible to control guitar effects and switch presets for use on stage while the 1/4 inch instrument and 1/4 inch stereo mic/line inputs are perfect for home or studio recording. Works with FourTrack, StudioTrack, GuitarTone and many popular third party applications. Add a standard expression pedal to control wah effects, volume, and more. Mic two sources at the same time by adding this custom 4 foot TRS to 2XLF Y cable. Ideal for when you want to get a stereo recording, record an amp and vocals, or even capture two vocals at once! 1 stereo ¼ inch output for headphones (stereo line-out) - use headphones with iPhone 7, iPhone 8, iPhone X (and earlier compatible devices), and charge while you play! Works with dynamic and battery powered condenser mics. 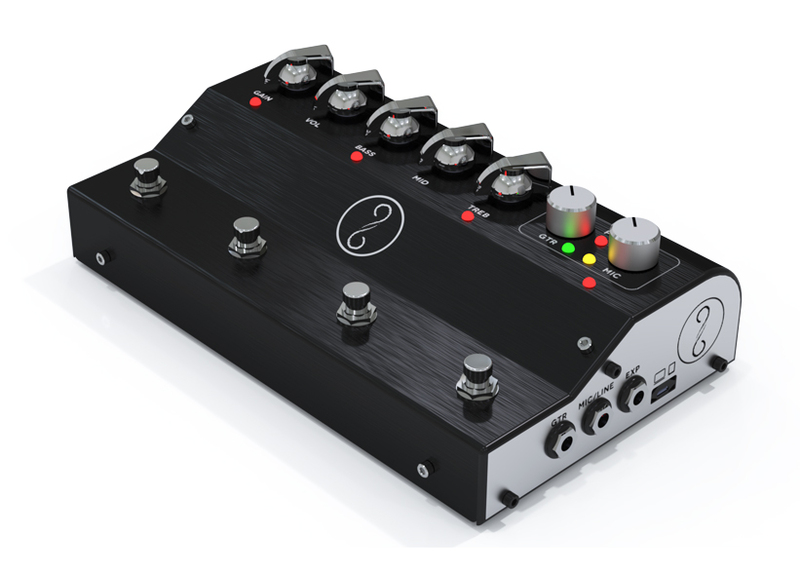 Provides 3.3 V Plug-in Power for mono or stereo Electret Condenser microphones. Device powered (no batteries or external power required for any of the above features). To charge your iPhone, iPad, or iPod touch (or reduce power consumption for compatible Android devices) while you play, add a standard guitar pedal 9V DC power supply (e.g. Godlyke Power-All or Truetone 1-SPOT). Power supply not included. *Android users only: The first batch of GuitarJack Stages include a 3 inch OTG adapter for Android that attaches to the included standard USB cable. This solution works great. Future GuitarJack Stages will include a custom OTG (Android) cable. If you are an Android user who would prefer the custom cable, please email support@sonomawireworks.com. Works great with iPhone 7, iPhone 8, iPhone X, and iPad Pro. Originally Made for iPhone 6 Plus, iPhone 6, iPhone 5s, iPhone 5c, iPhone 5, iPad Air 2, iPad Air, iPad (4th generation), iPad mini 3, iPad mini 2, iPad mini, and iPod touch (5th generation), and still works great with those devices. Allows you to use corded headphones with iPhone 7, iPhone 8, iPhone X (and earlier compatible devices), and charge while you play! Android™ with Samsung™ Professional Audio Technology (e.g. Samsung Galaxy Note 4). Android Lollipop and Marshmallow compatibility is pending. Compatibility is subject to change. © 2017 Sonoma Wire Works. GuitarJack and GuitarTone are a trademarks of Sonoma Wire Works. Apple, iPad, iPhone, iPod touch, Mac, the Mac logo, Mac OS, Retina, GarageBand, and Logic are trademarks of Apple Inc., registered in the U.S. and other countries. iPad Air, iPad mini, and Lightning are trademarks of Apple Inc. iOS is a trademark or registered trademark of Cisco in the U.S. and other countries and is used under license. Android is a trademark of Google, Inc. Samsung is a trademark of Samsung in the United States or other countries. Windows and the Windows logo are trademarks of the Microsoft group of companies. "Made for iPod," "Made for iPhone," and "Made for iPad" mean that an electronic accessory has not been designed to connect specifically to iPod, iPhone, or iPad, respectively, and has been certified by the developer to meet Apple performance standards. Apple is not responsible for the operation of this device or its compliance with safety and regulatory standards. Please note that the use of this accessory with iPod, iPhone, or iPad may affect wireless performance. GuitarJack Stage is available now for $299.